I didn’t see or play one until I transferred from community college to university. Still, none of the flute majors owned an alto flute, both altos belonged to the school. After graduating and joining a community flute choir, I became really interested in the alto flute. I didn’t care for it during college, but now that I didn’t have access to one, well…I wanted my own. 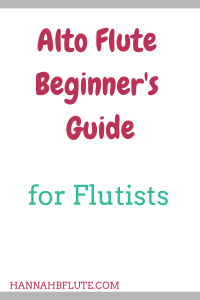 I’ve had my alto flute for about eight months now, and I feel (somewhat) confident writing this guide for anyone who is interested in this “small” big flute. What Is an Alto Flute? An alto flute is considered a low flute, because its range is lower than a C flute. It’s pitched in the key of G, so it sounds a fourth lower than the C flute. This can be a shock to many flute players, because the flute and piccolo are both in C (or concert pitch). You don’t have to transpose for flute, and the piccolo is easy since it transposes at the octave. Alto flute is another story, because it is the only commonly played flute that isn’t in the key of C.
Since the alto flute is lower than C flute, it’s also longer, and the tube is thicker. The alto is about eight inches longer than the C flute, and it’s thicker by about a quarter of an inch. Like the C flute, there are a lot of things to consider when you shop for an alto flute. The most common “spec” you want to consider is the headjoint. The straight headjoint makes the alto look just like a big C flute. You use the same balance points (lips, left index finger joint, right thumb) as on flute, so it feels very similar to what you already know. The curved headjoint brings the alto closer to you, because it is curved (duh). If you have small hands or short arms, you might not be able to reach all of the keys with a straight headjoint. Even if you can reach, it could get uncomfortable after awhile. The curved headjoint does have a slightly different balance than the straight headjoint. Since the tube isn’t completely straight, you have to figure out how to angle the headjoint in relation to the body. I chose to go with a straight headjoint, because my arms are long enough. I also just didn’t like the balance of the curved headjoint. There are pros and cons to both headjoints, so try both out for yourself to find what works for you. Do YOu Need Both Headjoints? Personally, I believe the only time you need to buy both headjoints is if you’re buying an alto flute for a flute choir or ensemble. If you’re buying an alto for yourself, you will probably only use one headjoint. There is a “school” of thought where you practice on the curved headjoint and perform on the straight headjoint. This makes sense until you consider the fact that each headjoint is different. It will take time to get used to the switch. If you want to perform on the straight headjoint, just practice on it. Unlike the C flute, it isn’t always practical to place your fingers directly on the alto flute keys. The added length makes it difficult to reach some of the keys, even with a curved headjoint. To combat this problem, many altos have ergonomic hand positions, especially for the left hand. The ergonomic hand position brings the left hand keys closer to you while leaving the tone holes (the holes that actually close) where they need to be. I love the ergonomic hand position, especially with my straight headjoint. If you choose a curved headjoint, it won’t matter as much, but it could still add extra comfort. I won’t sugar coat it, alto flutes can get expensive. Alto flutes range in price from $1,200 to 14,000. Since the alto isn’t a beginner instrument, you won’t find many beginner models. There are still different “classes” of alto flutes. You can expect to spend between $1,200 and $3,000 on your first alto. Common brands in this price range include Pearl, Gemeinhardt, Jupiter, Di Zhao, Trevor James, and Amadeus. Most of these altos are silver plated with a solid silver lip plate and riser. Some companies, like Gemeinhardt and Trevor James make black nickel alto flutes. This is where you start to see solid silver alto flutes. Common brands in this range include Pearl, Altus, and Yamaha. The Pearl and Altus altos are solid silver, and the Yamaha alto has a unique gold brass alloy. You really only need to shop in this price range if you are a serious alto flutist. Most of these altos are handmade and solid silver. Brands in this range include Sankyo, Altus, and Miyazawa. There are many places where you can buy an alto flute. You can go through a flute dealer such as the Flute Center of New York (FCNY) or FluteWorld. There are other big box music stores like Music & Arts that sell altos. You can also try alto flutes at various flute festivals and conventions. I bought mine through my local Music & Arts which was super convenient. I called my local store and asked for a trial. They had the alto shipped from another location so I could try it. I loved that I didn’t have to deal with the shipping. I would recommend that you try multiple altos before purchasing. There isn’t really any standard for key layout, so you want to make sure the alto you choose is comfortable for you. The piccolo is still more popular than the alto flute, but that may change in the future. Have you played the alto flute? Do you have any other questions about it? Let me know in the comments below!